Glenn Drayton’s journal is a bound volume consisting of Drayton’s rules of conduct expected of a U.S. sailor, 1814; and records, 1814-1864, of Rusticello plantation, Pendleton District, S.C., continued after Drayton’s death. 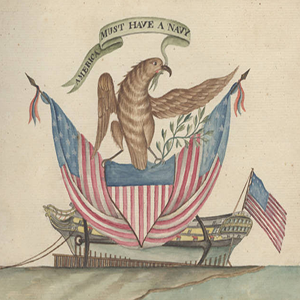 Drayton’s entries consist of hand-written guide, 1814, showing the hold stocked with barrels, and dimensions of the ship; and an original water color, presumably executed by Drayton, entitled, “America Must Have a Navy,”. After Drayton’s death, volume served as a plantation account book in upstate, S.C.; entries include medicinal recipes and treatments; list of slave illnesses and vaccinations, 1845-1861; and a record documenting births, baptisms, and deaths, 1814-1864, among the African American slaves of Rusticello plantation in Pendleton District [a region later divided into Pickens County and Oconee County].